The Prestige Auto Group’s story starts in 1998 with a Toyota dealership in Edmonton that was starting to fail. That’s when Jim Jiwani, the President of Prestige Auto Group, stepped in and bought it. He was ready to turn it into what he thought a car dealership should be: somewhere people felt comfortable, informed and were provided with great customer service. 10 automotive brands and dealerships later, and that’s what he’s done. We invite you to see the difference our customer service is to your vehicle buying experience. Mayfield Toyota started the Prestige Auto Group’s dedication to customer service, exemplary vehicle purchasing and catapulted the Prestige brand into the vehicle market. Not long after this dealership began growing and became one of the best Toyota dealers in Western Canada. Now Mayfield Toyota has a 7500-square foot showroom. 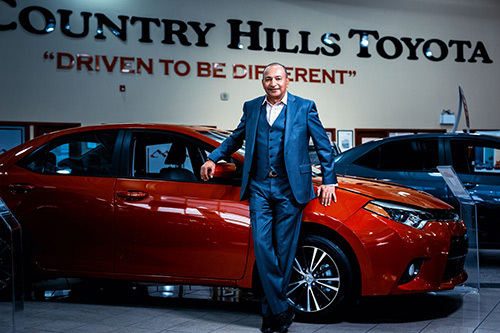 After the success of Mayfield Toyota, the Prestige Auto Group expanded to include South Pointe Toyota and Country Hills Toyota. Both have become amazing Calgary Toyota dealerships, with South Pointe being one of three Toyota certified, pre-owned dealerships in Canada. Country Hills Toyota currently has 100,000 square feet of vehicle space, so you can find everything you might need. With the success of Toyota by Prestige Auto Group, they grew to include Lexus South Pointe. In 2016, Prestige expanded beyond the prairies to include Oakville Infiniti, Oakville Nissan and Woodbine Nissan in the greater Toronto Area. Now the Auto group spans across the country, and will continue growing into the future. We’ve said it before and we will say it again. Every single one of our dealerships maintains the highest level of customer service. We want to make lifetime customers who trust us, and who always have a positive experience. We continuously update the way we do things. We strive to be better and get ahead of the curve. You will find us constantly innovating, and making investments in facilities and human resources. We will never stop striving to be better, so come in and meet us today.